Throughout his series of books, Curious George is referred to as a monkey. Taken from his home in Africa by the mysterious, unnamed “Man in the Yellow Hat” at a very young age, this popular children’s book star has captivated audiences with his books, television series and movies. But, as most of us know, monkeys have tails, and Curious George does not. George was introduced in Cecily G. and the Nine Monkeys, as a monkey living in Africa having adventures with a giraffe named Cecily. 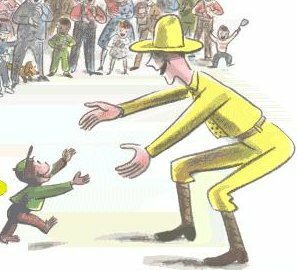 We see George with his mother, brothers and sisters, but in his very next book George is taken from Africa by the Man with the Yellow Hat with no depicted psychological turmoil, per se. George’s abduction is played more as an adoption, and George is more than willing to be with his new friend. Most people don’t notice that George is a monkey without a tail until it’s pointed out to them. Upon realization the first thought is that George must, in reality, be a chimpanzee or some other member of the great apes family. Wikipedia and other websites speculate on this. One comment from Yahoo Answers suggested that George used to have a tail until he became curious about a lawnmower. Though this answer has great explanatory power, in the book series continuity (none of his brothers or sisters have tails either) the tailless-ness is clearly genetic rather than environmental. Some monkeys do have very short tails, or nearly nonexistent tails, leading some to consider these monkeys tailless, but none of these monkeys much resemble George. The earliest scientific examination of a chimpanzee skeleton was conducted by Edward Tyson in 1698. He referred to the chimp (which had died by infection shortly after arriving in London) as a “pygmy.” Tyson was impressed by the animal’s similarity to man, laying much of the groundwork for Darwin’s 1871 blockbuster The Descent of Man. …in the Organization of abundance of its Parts, it more approached to the Structure of the same in Men: But where it differs from a Man, there it resembles plainly the Common Ape, more than any other Animal. It quickly becomes obvious that George is representative of a different species not related so closely to monkeys as he is to chimps, humans and other great apes. This species combines the curiousness of human children with the kindly good nature of the bonobos. Since George never expresses the aggressive behavior of chimpanzees, the Man in the Yellow Hat seems in little danger of having his face chewed off. IF YOU HAVE A SOUL YOU WILL IMMEDIATELY READ THIS BOOK TO YOUR CHILDREN!